The NCAA Tournament is over. After 67 games, plenty of highs and lows, we have our 2019 national champions. 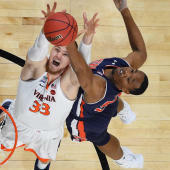 Virginia outlasted Texas Tech in overtime to claim its first ever in school history one year removed from one of the biggest upsets of all time. Now, they can confidently say they have exorcised the demons and claim a national championship. Below is every result of those 67 games along with the location of the games. Be sure to take a look at just how every game went down and get quick recaps of every game from the Sweet 16 on. Thank you for staying with us for coverage throughout this year's tournament.